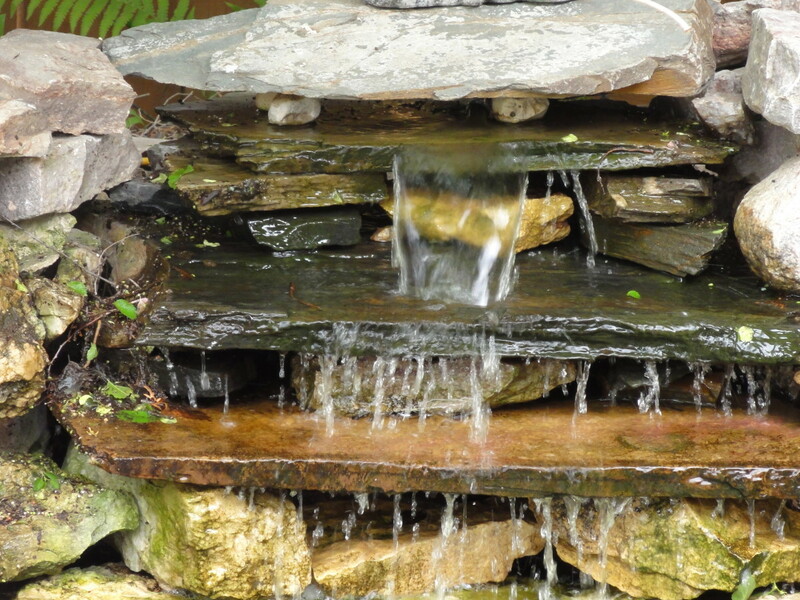 I created my own waterfall meditation pond a few years ago, and now spend endless hours enjoying the beauty, tranquility, and meditational zen-like peace it provides to me and my family. Of all the projects I've taken on around my home, there is something special about the waterfall meditation pond. The great news is you can create one, too. The entire project only takes one day's effort to complete and the best part is there is minimal maintenance. It will enhance your yard and give you that place to escape at the end of the day, everyday. 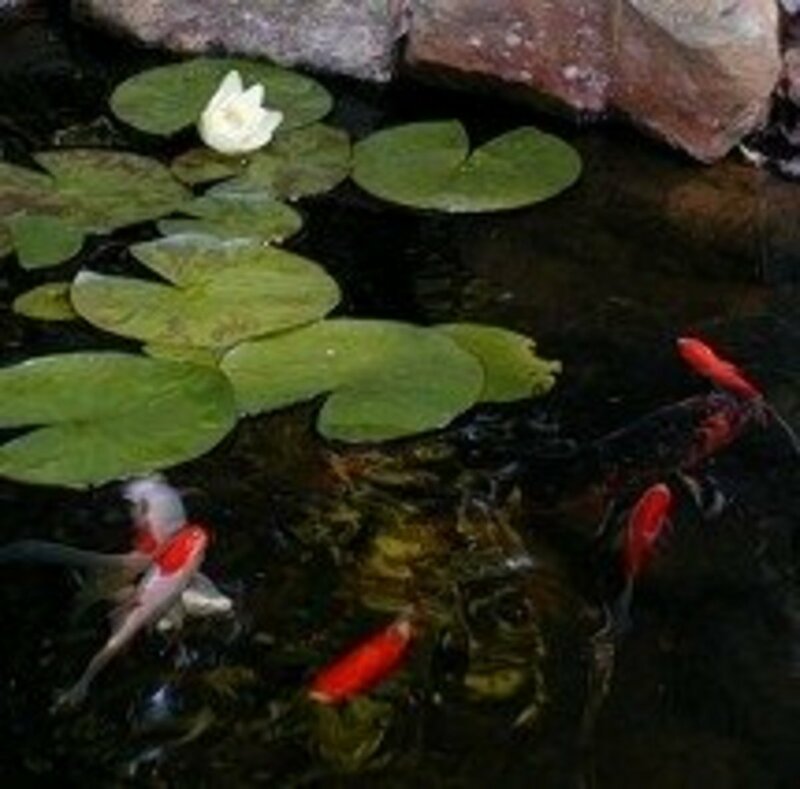 The items required for the waterfall pond can be purchased at most home and garden centers. 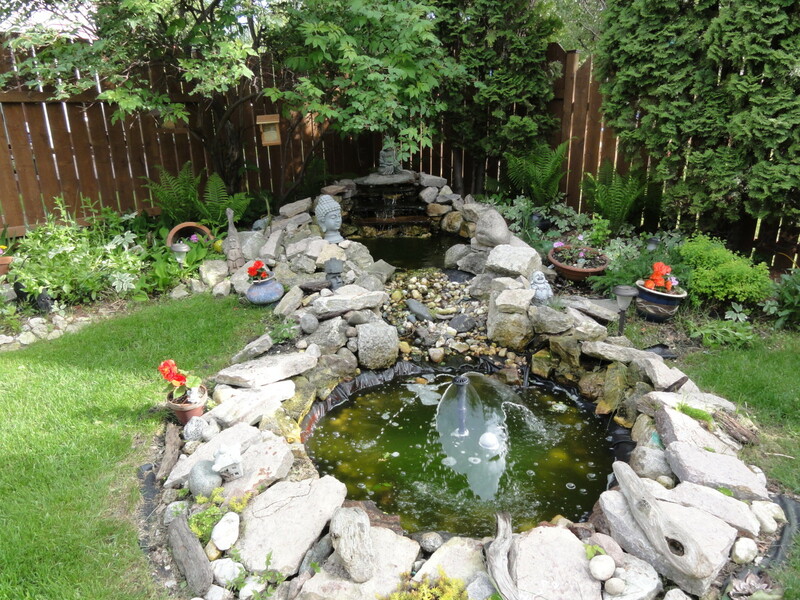 Total cost ranges from $200 to $500 and up, depending on how large a pond you are building. You can purchase a pond kit (as I did) with all these things included, except for the rocks and plants. This greatly simplifies the selection process. For this design, you will need to build two ponds, one upstream and one downstream. That's right, there will be two ponds and a stream connecting them. The first pond must be on a higher elevation, about a foot higher will be sufficient. If you have a naturally sloping yard, then preparation is simpler. If you have a flat yard, you will have to build up a raised area first. Allow for at least 3 to 4 feet between the two ponds for the connecting stream between them. 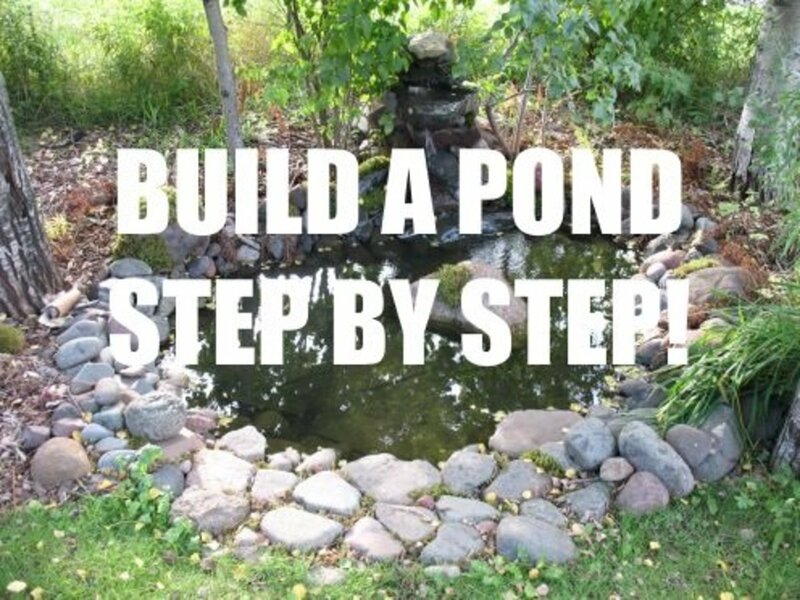 For each pond, dig out an area 6 feet across. Initially dig down 10 to 12 inches for the entire surface, then dig an inner hole measuring 4 feet across. This inner hole should be perfectly centered within the existing 6 foot pond area. Dig this inner hole down 20 to 24 inches. It will hold the pump in the lower pond, while the upper layer will have a small rock and stone cover. In the upper pond, the extra depth of the inner hole will provide an accentuated tone for the waterfall. Then dig out a 2 foot wide stream bed connecting the two ponds. The stream bed should be dug down 4 inches and connect the two ponds together. Once the pond areas have been dug out, you will need to line both ponds and the stream bed completely with the rubber membrane, which comes in rolls or sheets of various sizes and is specifically made for pond applications. 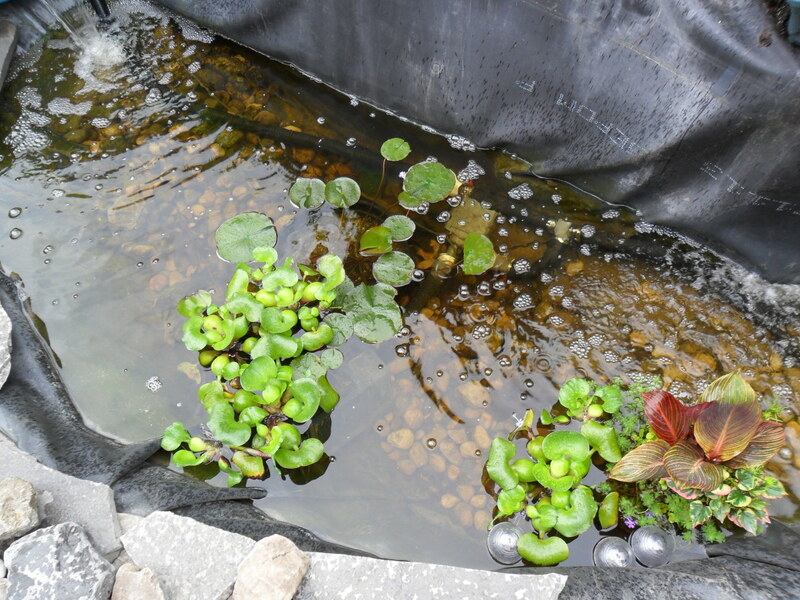 The membrane must overlap the pond edges by a foot on all sides. Where necessary, overlap sections of the rubber membrane from top to bottom with at least 6 inches of overlap. Seal the overlap areas with some exterior water resistant caulking. It's all a matter of choice, but certain rocks work better than others depending on where you will be placing them. For the waterfall, you will need at least three large flat rocks. Slate work well as it has a very rustic look and provides a perfect flat surface for the water to cascade down on. It is also easily stacked to create the waterfall. You will use smaller rocks as separation between the pieces of slate. You will also need various sizes and shapes of other rocks. 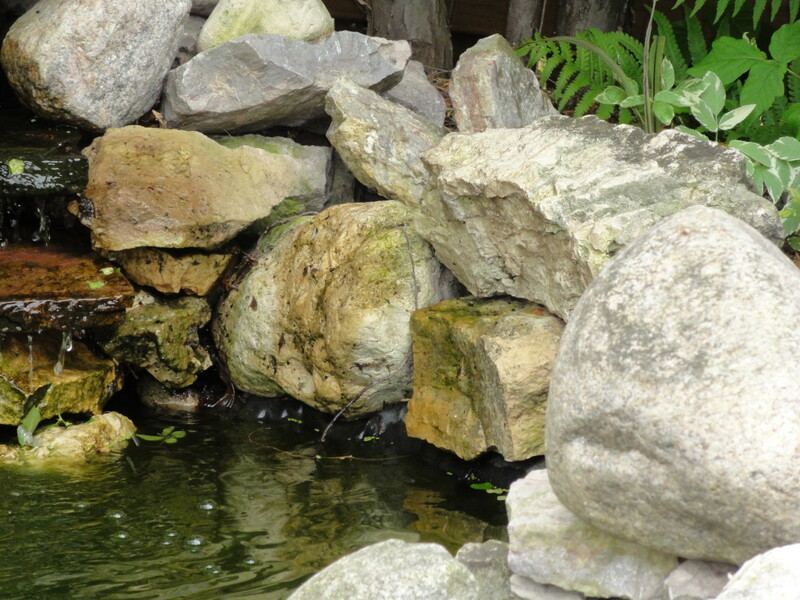 Ty to use rocks that will also provide a natural look and enhance the edges of the waterfall and pond areas. 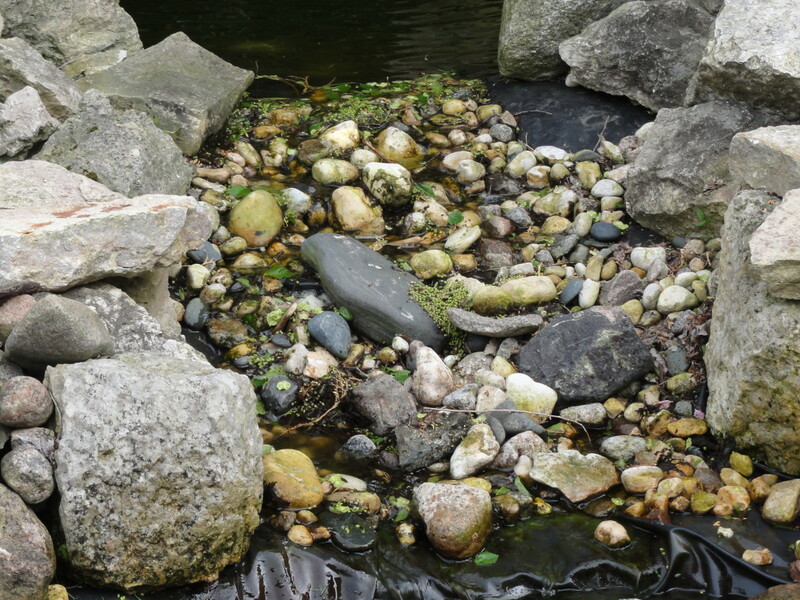 Find stones of various sizes, color, and shape provide the perfect finishing touch for the bottom of the pond and are great for filling in between the larger rocks. The main goal here is to create a natural look, so use your imagination and vision. The large slabs of slate make a wonderful waterfall. Finally, to complete your waterfall meditation pond, it is time to install the pump, filter, and tubing. The pump will sit in the middle of the lower pond. It's a good idea to place a flat rock on the bottom of this pond for the pump to rest on. This will allow the pump to sit higher than sediment that will form at the bottom. Connect the tubing to the outlet valve on the pump and secure with a hose clamp. The rubber tubing should be long enough to reach halfway back up to the top of the upper pond. Lower the pump into the lower pond's inner hole. Dig a hole on the side of the stream, either side will do but preferably the side that faces away from the yard. This should be about the midway point where the pump tubing can easily reach. The hole should be big enough to mount the water filter. The filter should rest inside the hole, with only its upper area showing. Attach the tubing from the pump to the inlet valve on the water filter and secure with a hose clamp, then attach a second rubber tubing to the outlet valve of the water filter. The other end of this tubing will run to the back side of the upper pond waterfall. Secure the tubing from the backside, onto the top large slate rock of the waterfall. Again, use various rocks to secure the tubing. The tubing must face forward so water is directed over the slate stone surface and into the upper pond. Now you just have to add plants as desired to create that natural look. Fill up the upper pond with water from your garden hose. 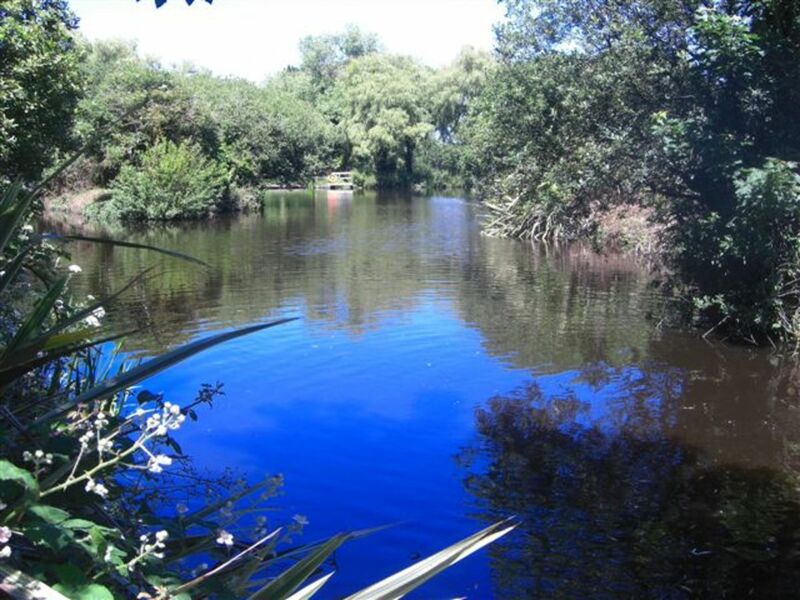 When the upper pond is full, it will naturally overflow into the stream channel and then into the lower pond. Once the lower pond is also full, you can shut off the water supply. You have just completed your own waterfall meditation pond. Now comes the exciting part, plug in the pump and the water starts to flow. You won't believe how great you will feel, while watching and listening to the water cascading down. It is the most relaxing sound in the world. Once all the pond and stream areas are covered with the rubber membrane, it's time to construct the waterfall. In the upper pond, first lay down some large rocks on the inner ledge at the top side. These rocks will serve as a foundation for the larger slate rocks to rest on. 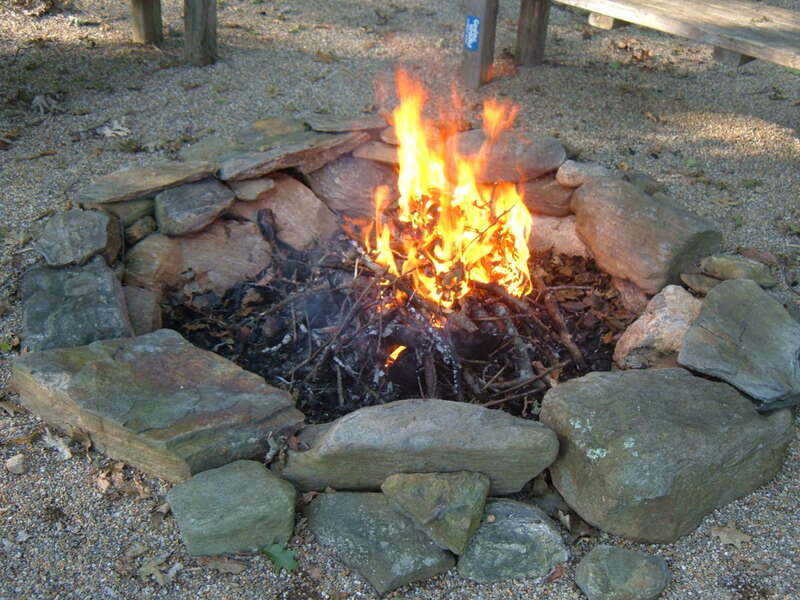 The Initial rocks should be large enough so the tops of them are just below the top edge of the pond. Lay down the first large slate rock on top of the foundation rocks. The front edge of the first slate rock should over hang the deeper inner pond slightly. The second large slate rock should sit back 2 to 6 inches. Lay down some smaller rocks on top of the the first slate rock, then lay down the second large slate rock on these smaller supporting rocks. The size of these smaller supporting rocks is up to you. Decide on the look you want, and go with it. You really can't go wrong. You may have to build up some back support for the large slate rocks as well. As each layer sits further back than the one below it, you want to make sure they don't tip backwards. Continue building layers, at least three is preferred, but you can go higher. Once the waterfall is assembled, you can add various rocks to fill in the gaps. For the inside ledges, add smaller rocks 2 to 4 inches in width. Also add various rocks and stones to the stream bed. Even a piece of driftwood can help create a natural look. You'll find that where ever you go, you'll always take note of any special rocks and stones you come across. 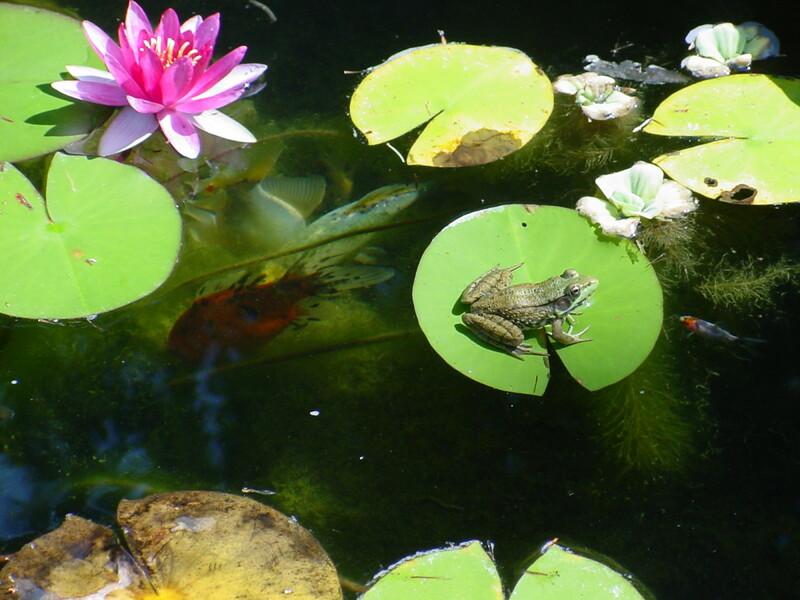 When you add them to your pond, they will add even more meaning for you to enjoy. 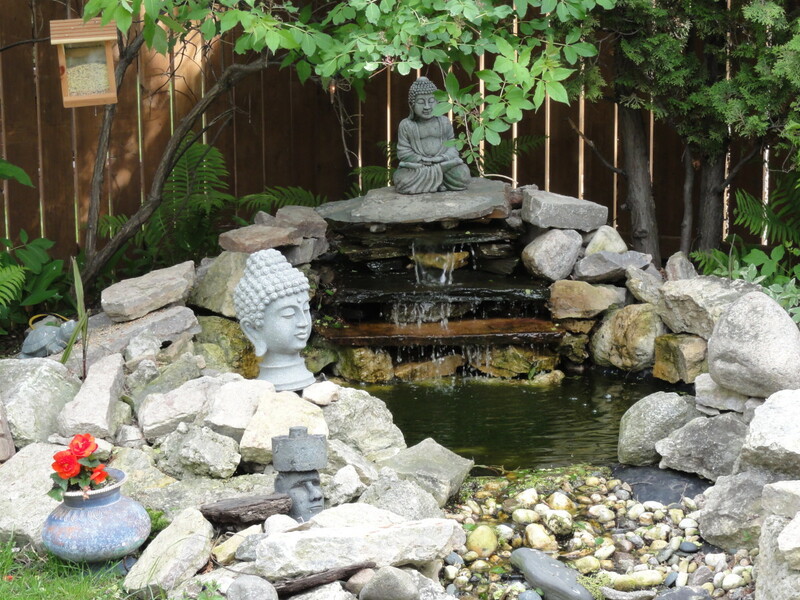 You will absolutely love your yard when you can relax by your own waterfall meditation pond. The natural elements of the rocks and the sound of the water spilling over the rocks and into the pond below completely takes you away from all of your stress. This will be the first place you go every day after work. Just being there is like practicing meditation without all the work. The whole family enjoys the tranquillity and peaceful surroundings of the backyard paradise. 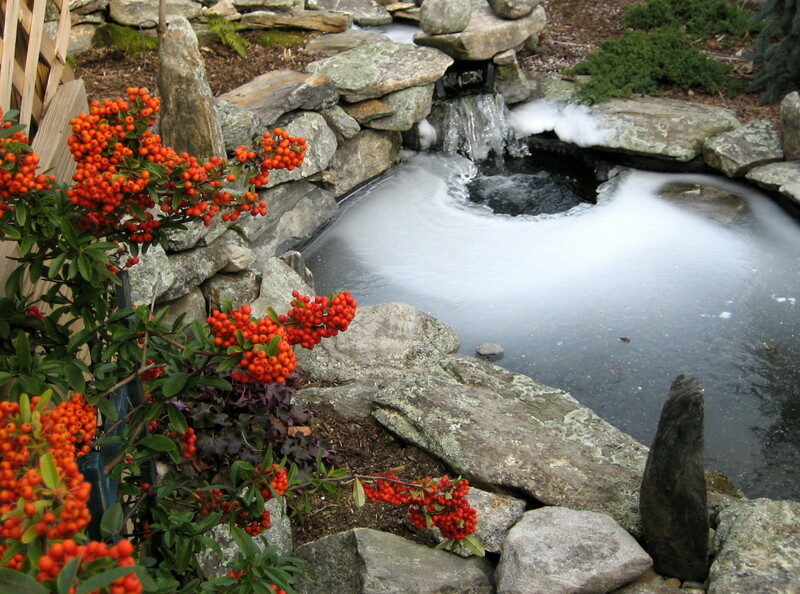 Thanks for commenting Bruzzbuzz, even in Winter the wsterfall pond adds peace and tranquility to the yard. The birds and squirrels love their visits all year round. 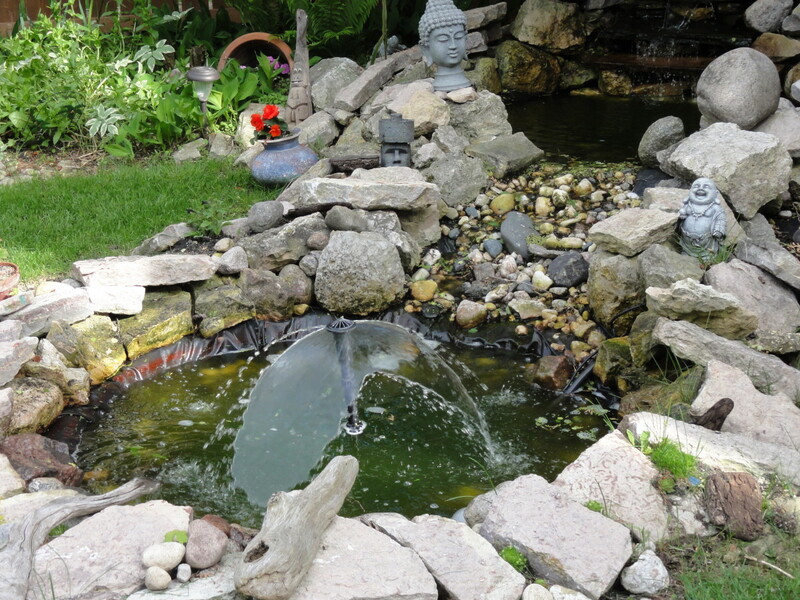 I think you will definitely do well by having a waterfall meditation pond in your yard. Thanks for a great hub. I am going to build a similar one this summer and will come back to this hub before I start. Thanks for commenting Kaylee, there is never enough time to do all the things that need doing and still have time to enjoy them as well. But here's to trying, Cheers! Wonderful hub, and a neat idea. I would like to make one for our daughter Becky to enjoy someday. Thank you for sharing this informative hub that has some great suggestions. God Bless You . Thanks oceansnsunsets for commenting, its definitely worth the effort. I can't imagine my yard without it! Carcro: Very nice! Thank you for dispelling the mystery which can surround a garden feature such as a meditation pond. Your explanations are precise, and your photos convincingly play their supporting role. You are very welcome Ingenira. Let me know if you have any questions, I'd be glad to answer based on my own experience. That's very encouraging to know, Carcro. I think I want to start something in my garden soon. :) Thank you ! Your Waterfall Meditation Pond is so cool ! I'd like to have that in my house. Can you really DIY things like these by reading and follow the instruction from a book or your instruction here, or some related experience is necessary ? Thanks prairieprincess, definitely a good idea to have your husband do the heavy work. Thanks for commenting on my hub! Wow, what a wonderful idea! I love to look at this kind of thing but truth be told, I would need a lot help from my husband for something like this. Maybe next summer we could try it out ... lovely hub! a really interesting hub as I'm planning something similar myself for next year. Some useful tips here. I hope you find the peace you are searching for by your pool. Hello carco, so this is where you sit and enjoy your garden! This would be a great project for next year! Thanks Danette, you're right about the sound of water. I built this pond a few years back, and it has been my favorite place from spring to fall. I can't tell you how much the waterwall pond helps me relax at the end of the day! Thanks for the vote! What a great meditation pond! Wish I had space for something like this where I live. It's beautiful and the sound of water can be very soothing. Voted up and awesome. Thanks suzettenaples for commenting and the vote up! You're so right, the waterfalls are extremely relaxing, and add so much to the backyard. The rocks can be heavy, so its a smart thing to get assistance when you need it. This is a wonderful hub. Your directions are very good and this looks fairly easy to build. My sister has done this, althought she designed hers and then hired someone to build it. These waterfalls are such a relaxing thing to add to the backyard or patio. Voted up! Love this - maybe next spring I may find the time to do this. Thanks for the excellent Hub and the follow. Rated up and useful! I'm sure it has worked for some, I found mine long before, but for those who are still looking, why not? At worst they would be very relaxed, and that's a good thing! Thanks for commenting! Is it true that Waterfall Meditation for finding true love..? Thanks for reading and the comments, it really is a great way to relax at the end of the day. This is beautiful. A project I really would love to undertake. Really nice Hub! Happyboomernurse - thanks for your wonderful comments! You're so right, the animals love it, we spend endless hours just watching the little critters from the patio, enjoying the beautiful sounds of nature. Lyn - We will drop peanuts in the shell behind the pond, and its great to watch the squirrels as they hide all the nuts first, and then come back later to dig them up and eat them. Great idea for lighting. I actually have some over head lighting but really like the idea of adding a few solar lights. Thanks so much for commenting! Love the sound of the squirrels ... we don't have them in New Zealand. A couple of statues holding solar lights would look good if you wanted to add some lights that don't ruin the theme. Love how natural looking you have gotten your pond. Wow! This waterfall meditation pond is really beautiful and you have provided concise instructions on how to build one. I have a small waterfall on my deck and do find it relaxing and conducive to meditation. It also attracts birds who love to drink from it. Thanks for posting this information. Am voting it up, useful, beautiful, awesome and interesting. Thanks carcro, THIS is excellent, and on my to do list, probably next spring. I think this is something that I can do and enjoy doing it. Carcro these ponds look very wonderful. Moving to Sedona Arizona vortex center of the world. These ponds would be a great addition to the back yard. You have a good point, any water feature will provide you with an escape from stress. I really notice the difference in the yard when I switch off the water pump, the water stops flowing and its like I'm in the desert. Thanks for your comment! I would probably get a little stressed trying to build this myself but I have a simple water feature in my garden which I find extremely soothing so I think it is a great idea if you have the room.